I love my living room. It is high, statuesque and just oozes old world charm. It has unique vintage details with the ornate ceilings, huge stained-glass windows, original wooden window shutters and a big fire place. Somehow, I never got it quite right though. Couldn’t exactly put my finger on what was missing. I have a gorgeous grey corner couch, quite a stunner really. The colours on the wall are fab too. But something was missing to tie it all together and I couldn’t work it out. Until now! A few years ago (for a significant birthday, am not going to tell you which one!) my hubby took me to Morocco. A day trip to the Atlas Mountains made me fall in love with the Berber community and the gorgeous handmade handloomed Berber rugs. Visiting in person makes you really appreciate the craftmanship involved, and the dedication that’s being put in each and every rug. I would have emptied all stores and market places there but couldn’t. If you ever have a chance to visit that part of the world, please do. It is just stunning. Ever since that visit I have been eying off interiors with gorgeous Berber rugs. Participated in every give away (why am I never the lucky winner?) and been sending all these picture hints to my husband. Then I came across the amazing Etsy shop of Kenza and Co online and what I saw blew my mind: what a selection! And such unique versions. I saw types of rugs I have never seen before. I was stoked. Here I would definitely be able to find something that would add that bit of oomph to my living room. 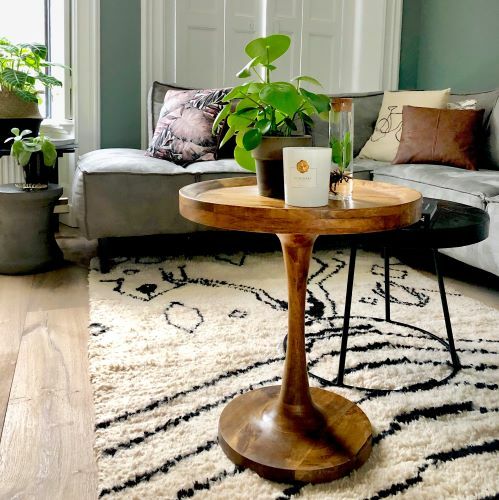 Can you imagine my delight when Begoña, the gorgeous show owner based in Madrid, Spain, suggested to have one of these beauties shipped straight to my living room? How lucky am I?? 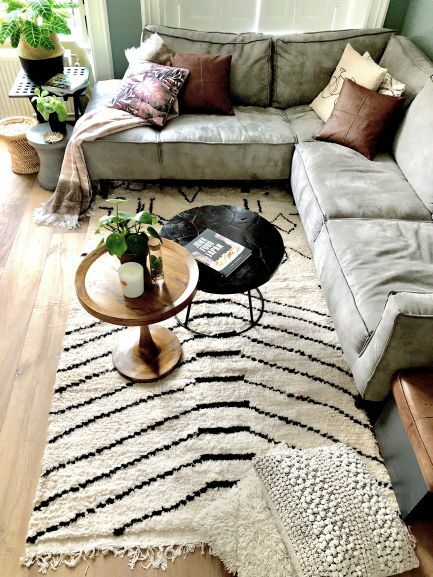 I am a big fan of the classic Beni Ourain Rugs with the geometric patterns. I think they’re absolutely gorgeous. You see them a lot these days. That’s only natural, they are simply beautiful. However, I wanted something just a little different. Something original, something that would pop. 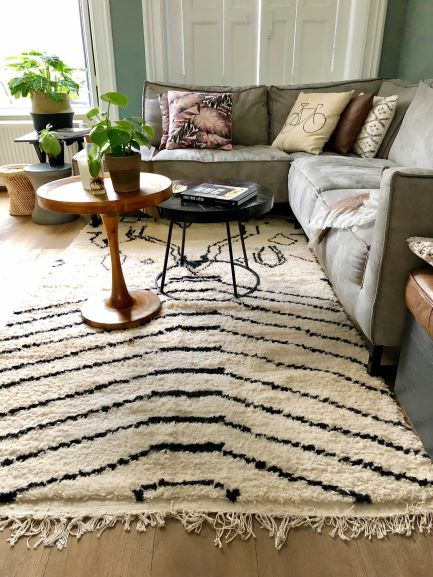 I chose this beautiful contemporary, authentic and unique Beni Ourain Rug, incredibly densely hand knotted in natural undyed wool with a black pattern that jumps off the ground. It feels luxuriously soft and cosy! For the OCD minded amongst you, this pattern might startle you. It’s a little different than the even geometric patterns you may be used to. But for me, that’s the bit that added the interest, the talking point. I love it. 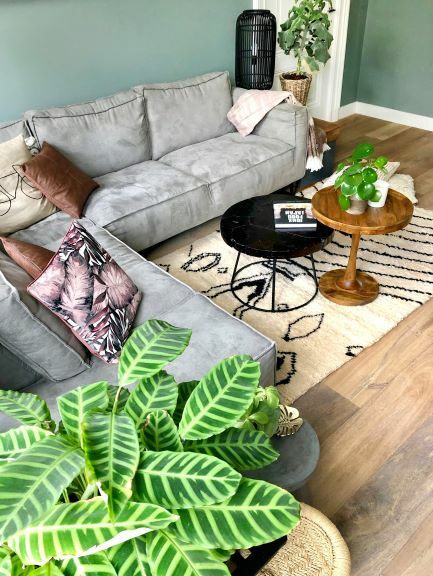 And don’t worry, you can add the structure back in your interior design by careful placement of coffee tables and other accessories. The colours are a classic. I did consider a colourful rug, truth be told. But kept coming back to this one. The black and white colours are easy to combine with whatever tickles your fancy at that point in time. Keep it light, with easy breezy furniture and colours for a summer vibe in your living room, or add lots of layers, cushions and warm textures to create a cosy spot in front of the fire place. Anything goes, the world (or your room) is your oyster really. 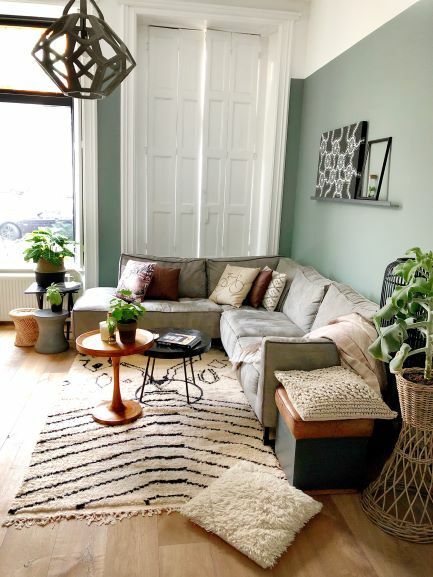 I decided to do a bit of an accessory shuffle in my living room for a spring revamp. I added a gorgeous wooden side table to my already existing black one and decided on touches of pink and cognac leather for a splash colour. 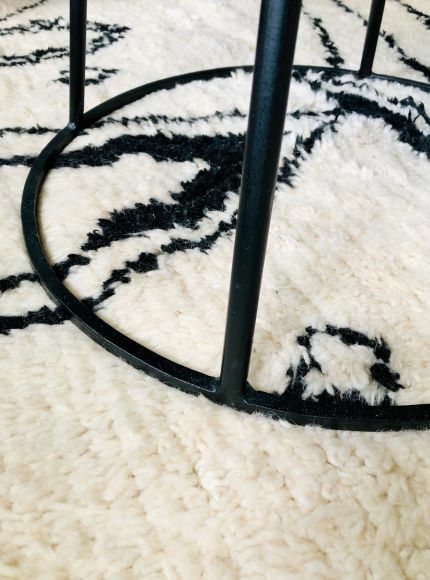 I love it that my new Kenza And Co rug is a one of a kind. There is only one of these in the whole wide world and it’s in my living room! Kenza and Co select all rugs themselves, negotiated directly, without intermediaries, with the women’s cooperatives in the Atlas Mountains of Morocco. It makes me feel good to own a handmade product whose producers are committed to the environment. You get a unique and personal piece and foster sustainable livelihoods, fair trade markets and a working model compatible with family life. 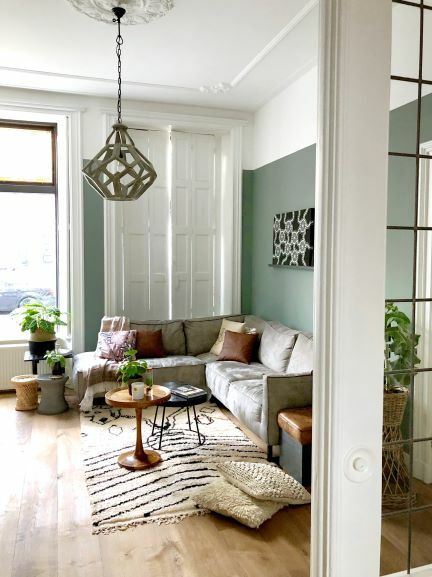 When you’re in the market for a new rug (or anything else really) consider shopping small. You’d be amazed with the selection of the Kenza and Co Etsy shop. They ship internationally and the prices are very fair too. It is lovely to experience the personal journey of the shop owners and own your little piece of the history of the world. I am a big fan. Are you? Wat lief Mindy! Ben ik mooi super blij mee! Super gaaf en wat ligt ie bij jou op zn plek ! Leuke blog weer van Marieke ! Dank dank Carla! Wat lief! Leuk om te lezen Marieke! Nou ja, zoals ik al schreef.. (Het is nog steeds zo… ben nog steeds een beetje jaloers op jouw kleed) Mooi verhaal ook. Hahaha nou ik was altijd zo jaloers bij anderen dus ik snap het! Kijk eens in het winkeltje van Kenza! Je weet maar nooit. Dank dank babe. helemaal mee eens Maria! Hartelijk dank! Wat lief!